What do you do when you want to do something that the Opengear ACM5004 doesn’t support out of the box? You roll your own firmware, that’s what! In reality, you only need to do this if you want to install packages that aren’t included already, or to make permanent changes to other core files, so it’s not something most people are likely to do. Still, I like to play around with hardware, and hopefully I can create a basic guide that’s helpful to anybody who wants to try it. The first thing to note is that these files are dated July 2012, but the latest firmware versions are from October/November 2012. This is the first ‘gotcha’ when rolling your own firmware – the CDKs contain a version of firmware that you can alter, but the CDKs are not updated at the same time as the available firmware releases. In this case, the CDK contains firmware v3.5.3, whereas the latest available trains on the download page are actually v3.5.3u5 and v3.6.0. I understand that the CDK will be updated, but it lags the image release by at least a few months. The ACM5004 is an ARM based platform, so I downloaded the arm-linux-tools-20061213.sh file as instructed by the User Guide. It’s not a standard shell script, but rather it’s effectively a self-extracting archive. 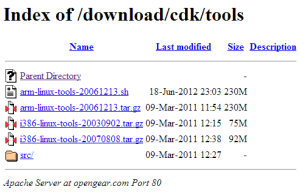 Note – should you download using FTP – that the FTP URI given in the user guide (“ftp://opengear.com/tools/”) is incorrect – it should actually be ftp://ftp.opengear.com/cdk/tools. The User Guide says that the instructions are for a 32-bit x86 installation of Ubuntu 10.04, and notes that the KCS and CMS product ranges will not build on a 64-bit distro. I actually installed Ubuntu 12.04 LTS Server 32-Bit in a VM on Oracle’s VirtualBox and the process seemed to work fine. Next, we need to install some specific packages that are required for the build process. For ARM products (like the ACM5004) I needed to install zlib1g-dev (to confirm, that’s ZLIB1G for disambiguation purposes). For i386 products I would also need to install bin86, qemu and genext2fs, but in this case they don’t apply. drwxrwxr-x john 4096 Jan 6 16:25 .
drwxrwxr-x john 4096 Jan 6 16:24 ..
drwxr-xr-x john john 4096 Jul 17 12:31 .
drwxrwxr-x john john 4096 Jan 6 16:25 .. I now have a directory ‘romfs’, and can edit the alert-email script to my heart’s content. drwxr-xr-x john john 4096 Jan 6 16:52 .
drwxr-xr-x john john 4096 Jan 6 16:46 ..
It’s blindingly obvious (that’s sarcasm, by the way) that you will want to copy the file ‘image.bin‘ to your usual computer (if Ubuntu is not your normal host) and use the Opengear web interface to upgrade the firmware using your new file. The User Guide confirms that within the space restrictions of the target device, you can modify the kernel and application set (via the config system – i.e. “make config”) and you can add custom binaries in the user/ directory. I may brave this shortly – whittle down the built-in apps to make some space, and install something new that I’d like. I suspect that will take time though, so I’ll come back to that perhaps at a later date. The obvious benefit of a custom firmware image is that you can add an application that was not available to you before, albeit with some very tight space limitations. That could open up some remarkable possibilities for how the Opengear device could be used. From an administrative perspective though, it might be very helpful to be able to ‘lock in’ some changes in the firmware so that nobody can alter them. Remember, most of the linux image is readonly so anything in a readonly location is protected even from a root user making changes. So for example, you could remove the code in the alert-email script that checks for a similarly-named script in the user space, thus ensuring that only your chosen (readonly) alert-email script is ever run and cannot be overridden. 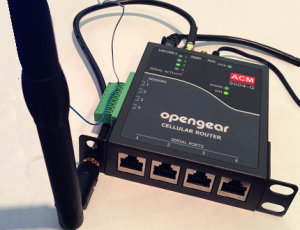 Opengear support may not support you on anything they believe is as a result of your custom firmware tweaks. Of those, if you’re happily installing custom apps and building firmware images, you’re probably smart enough to troubleshoot and fix any problems you caused. Not having the latest firmware though could be an issue. I understand that firmware 3.6.0 for example has a newer cellular driver than 3.5.3 – and if I create a firmware image today using 3.5.3, I therefore am not able to use that new driver. Depending on the feature or driver missing, this could be critical in some applications. On the other hand if you don’t have any issues with 3.5.3 (and there are no security issues known with that code), you may not care, and would be happy enough to roll that out. It might be possible, I suppose, to extract the file structure from a working 3.6.0 image file and see if those files would work when compiling from the existing CDK structure. I don’t know – but I can’t help suspecting that there must be a gotcha somewhere. There are a few errors and omissions in the documentation, which could be fixed easily. I still don’t like being presented with a listed directory when I go to download files (sorry). And having out of date firmware images in the CDK is a little frustrating. However, maybe I’m being a bit picky – or even slightly unreasonable. After all, how many other companies would allow you to mess with their firmware like this in the first place? It’s an amazing thing to be able to do. Perhaps a delayed CDK release schedule is the price we have to pay for this level of flexibility. At the end of the day, this isn’t a task for Joe User, and it’s not intended to be. The bottom line is that the firmware creation process seems to work (with a note that I haven’t added software to it), and within a fairly short time I was uploading my own firmware image to the ACM54004-G. I can’t really argue with that. Opengear was a paid presenter at Networking Field Day 4, and while I received no compensation for my attendance at this event, my travel, accommodation and meals were provided. I was explicitly not required or obligated to blog, tweet, or otherwise write about or endorse the sponsors, but if I choose to do so I am free to give my honest opinions about the vendors and their products, whether positive or negative. 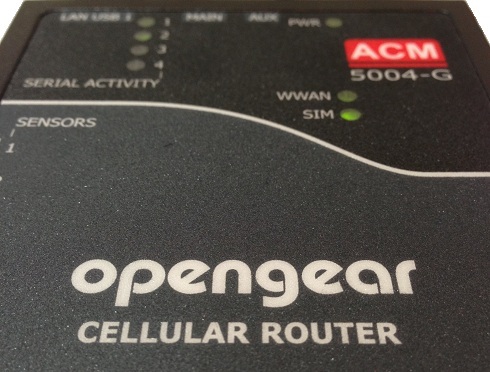 Opengear provided me with an entry-level console management device (ACM5004-G), and more recently an ACM5004-G-E, both of which I am using as test hardware to create the content for these posts.